John Katori seems to have changed each community in which he has been a member. His dedication and commitment to the local, education, and athletic communities are unparalleled. A 1949 graduate of Bartlett High School, John�s roots and loyalty have been expressed through his contributions spanning almost sixty years. In high school, John played football, basketball, and baseball. His success may not have been put up in stats or numbers but was equally as valuable and evident with being awarded the American Legion Good Citizen Award in 1949. Upon graduation, John enlisted in the US Army where he enjoyed success on both their basketball and baseball teams. In 1955, John found himself earning his first of many degrees from Nichols College in Dudley. In 1958, the professional contributions to his local community began. For over third years, he served on the Nichols College Hall of Fame Committee and is responsible for championing and ultimately beginning the Bartlett Athletic Hall of Fame. John saw an overdue need for Bartlett athletes to be recognized and celebrated for their athletic contributions. Due to John�s extensive legwork and thorough research, past and future Indian athletes can be honored and remembered. 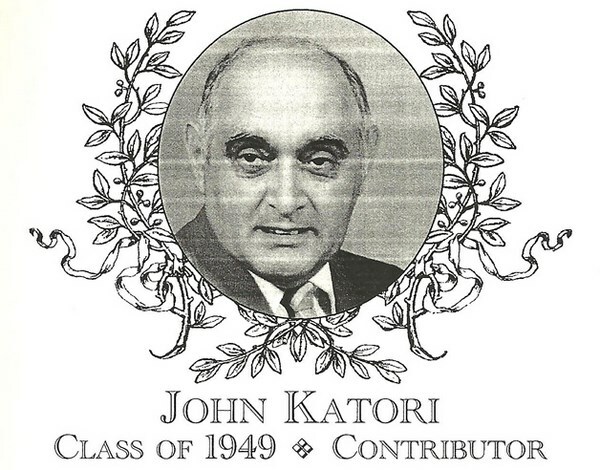 John Katori was a professor emeritus and coach at Nichols College for over forty years. He served on various committees, began number successful organizations, and gave his time, effort, and support to his community for over sixty years. He has impacted thousands and will continue to. His contribution to BHS is unmatched and his spirit and pride seems to be in those current Indian teams who wear the Green and White. John retired from Nichols a few years ago and lives in Charlton with his wife Barbara. They have two children, Kevin (36) and Kristina (31).